Have you noticed any differences in how you experience time during your listening sessions vs time in your ordinary life? I’m asking because time is on my mind. And because I recall several occasion when we, as listeners, have talked about how we appreciate waiting. While the rest of the world rushes by, we listeners wait. We wait for a guest to arrive. We wait for them to start sharing. We wait when they dip into silence mid sentence. We wait instead of rushing in to fix a situation and we listen to what is on our guest’s heart concerning their situation. We even wait at the beginning of each shift as we sit in silence for 5 min before serving. 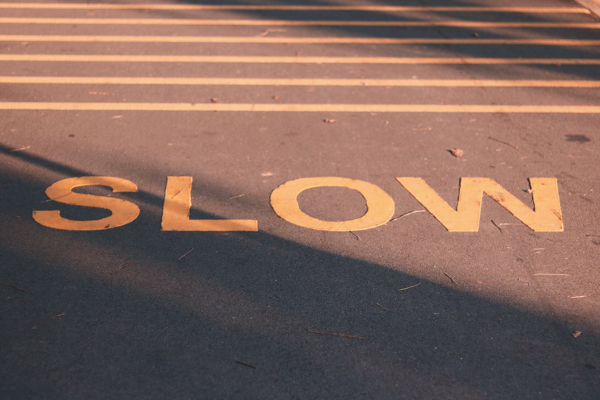 Waiting in silence intentionally gives us a chance to slow down from our ordinary ways. Part of me wants to say that there is an urgent need for the service of listening in our communities. But there is another part of me that, today anyway, doesn’t understand the term ‘urgent.’ That part of me senses the feeling of urgency creates the pressure usually associated with it. This morning my own sense of urgency suddenly made me laugh. And again as I perused pictures for today’s letter, I laughed out loud when I came across the irony of ‘slow’ written on a highway. This morning I noticed an old feeling of urgency – something came up that I felt I had no choice about, something I had to rush to do. But something else kicked in and I wondered if maybe I did have a choice – and if I did, what else might I choose besides rushing in? All of these considerations, and more, happened in a nano second, of course. In that split second that I didn’t rush in, I got a glimpse of the feeling of urgency. In that moment, if my description can do it any justice, I saw that the feeling of urgency seemed to create the feeling of choicelessness. I’m making a guess that it is hooked up that way because when I didn’t rush in, I found I did actually have a choice of how to respond. And, interestingly enough, the feeling of urgency faded along with the assumption of choicelessness. The whole thing went from urgent to suddenly witnessing for myself that there was actually plenty of time available to make a decision. What is more interesting to me, though, is that this isn’t actually a new experience. I experience this kind of re-direct when I serve as a listener. Slowing down from habitual reactivity just becomes part of listening. Or, if I do get triggered by what a guest shares, I sense reactivity as distinctly different from deep listening. Reactivity is lightening quick. Deep listening is like life slowing down. When life slows down, when we are simply present listening, it also opens up. Maybe these are just natural link-ups. Slow is linked to open and all the time in the world just like urgent is linked to choicelessness and time pressures. Listening invites the slowing down and opening up of life. The practice of listening also invites us to check in and learn from listening itself.